Introduction: This is the first of four posts by Boyle Heights Historical Society Advisory Board member Rudy Martinez about the origins of electric lighting in Los Angeles, consisting of tall mast lights including one in Boyle Heights. Since this time of year is a time of holiday celebrations, often involving bright and colorful illumination and higher than usual electric bills, this series of posts will look at the events leading up to the inauguration of electricity to Los Angeles through the erecting of seven 150-foot “light masts” that served as the city's first street lights. One of these was located at First Street and Boyle Ave. in Boyle Heights, and was switched on during the evening of December 31, 1882. Before there were electric lights, the town of Los Angeles was a very dark place at night. Although a Mexican-era ordinance required homes with two or more rooms to hang a lighted lantern outside the front door and this carried over into the American era to apply to stores, hotels, and saloons, Los Angeles remained a largely darkened community at night until after 1865. 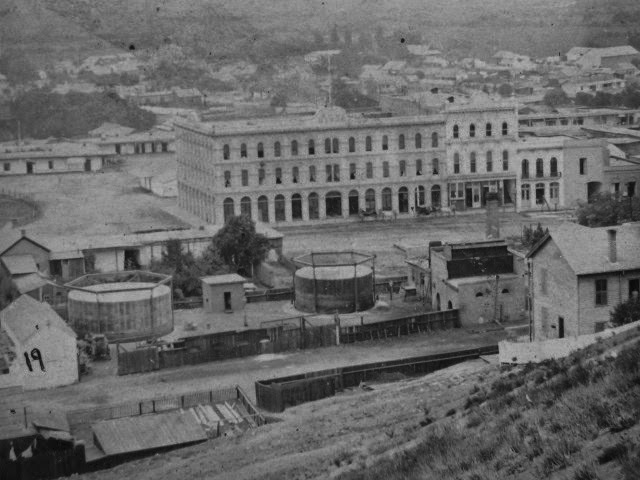 This circa 1870 photo by William M. Godfrey shows wooden tanks of the Los Angeles City Gas Company on the west side of Main Street across from the Plaza, Pico House, Merced Theater and Masonic Hall. From an original stereoscopic photograph in the Workman and Temple Family Homestead Museum Collection.. In that year, the Los Angeles City Gas Company, with future Boyle Heights resident William H. Perry as a director, was awarded a franchise to provide gas for illumination to streetlights and private homes. Perry began operations with a gas works directly across from the Plaza, where the Brunswig Building stands now. 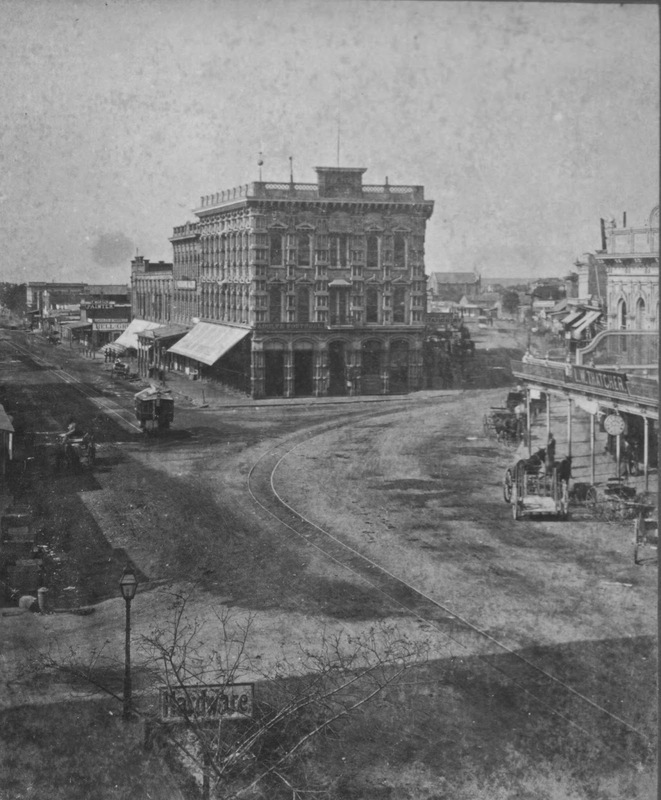 This circa 1877 photo by Francis Parker shows the intersection of Main Street (left), Spring Street (right) and Temple Street (out of view to the right), anchored by the multi-structure Temple Block. This site is now Los Angeles City Hall. Notice, however, at the bottom left one of the gas street lamps installed in the city during the preceding several years. From an original stereoscopic photograph in the Workman and Temple Family Homestead Museum Collection. By the mid-1870s, however, newspapers around the country were carrying stories about a new source of light that promised to be brighter, safer, and cheaper than using gas – electric illumination. The early focus was on a type of light called arc lamps. Illumination was achieved when two closely-spaced electrified carbon rods emitted between them a high-voltage electric current, creating an intensely bright, bluish-white light. For years, early results were mixed; plus, the arc lamps required an energy-hogging generator, a dynamo, as its power source. Not until the late 1870s when an inventor from Cleveland, Ohio named Charles Brush unveiled a more efficient arc light and dynamo was this new technology finally seen as practical enough to be developed and sold as an alternative to gas illumination. Encouraged by windy promises voiced by the cozy allies of newspaper editorial boards and venture capitalists seeking potentially profitable franchises, U.S. cities began to demand this newly-improved, but certainly not trouble-free, light technology as soon, and as affordably, as possible. Re-purposing existing gas infrastructures or building entire new grids were seen as too expensive, yet cities were eager to quickly harness the arc lamp's intense brightness in the most cost-efficient means possible, so early adapters would find inspiration from above: moonlight. Several arc lamps could be placed at the top of a metal lattice-type tower, anywhere from 150 to 300 feet tall, from where they cast light on the area below. An arc-light "moonlight tower" in the distance at San Jose, California, ca. 1880. 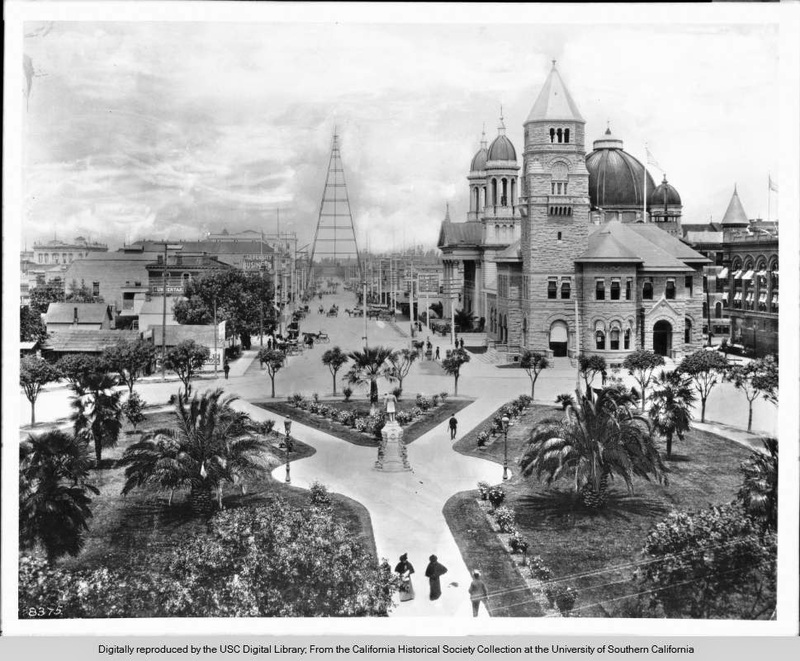 From the California Historical Society Collection at the University of Southern California's Digital Library. These structures would commonly become known as moonlight towers, the first erected in Brush’s hometown of Cleveland in 1879 and was soon followed by other cities like New York, Detroit and, in California, San Francisco and San Jose. However, in name and design, the Los Angeles model would be uniquely different. Really enjoyed reading this! Thanks for taking the time to research & post this. Hello Frank, thanks for the comment. Rudy did a great job on this series of posts. Check back regularly for more interesting Boyle Heights history. Great post which I enjoyed very much. It's nice that the wealth of available materials online enables us to pursue the details of our history, instead of just looking at city maps and old buildings in a superficial way. Hello AimlessInLA, thanks for your comment and glad you enjoyed Rudy's excellent post.